Liftoff is no earlier than 6:30 p.m. EDT/2230 GMT). Update for 7:22 p.m. EDT (2322 GMT): Rocket Lab has called off today's launch attempt of an Electron booster carrying DARPA's experimental R3D2 satellite due to a video transmitter issue. A new launch date will be announced once it has been selected. Original story: The commercial launch provider Rocket Lab is counting down to its first flight of 2019, an experimental satellite for the U.S. military, and you can watch it live online today (March 24). 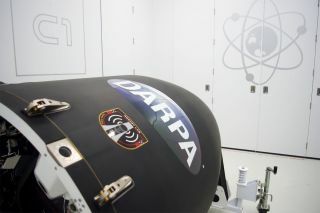 The R3D2 satellite (its name is short for Radio Frequency Risk Reduction Deployment Demonstration) is a test flight aimed at demonstrating a new type of space antenna, according to DARPA. The 330-lb. (150 kilograms) payload is a tightly packed "membrane reflectarray antenna" made of tissue-thin Kapton that is designed to unfurl out to a maximum diameter of nearly 7.3 feet (2.3 meters). "R3D2 will monitor antenna deployment dynamics, survivability and radio frequency (RF) characteristics of a membrane antenna in low-Earth orbit," DARPA officials wrote in a statement. "The antenna could enable multiple missions that currently require large satellites, to include high data rate communications to disadvantaged users on the ground." The satellite took just 18 months to design and build, according to DARPA. "A successful demonstration also will help prove out a smaller, faster-to-launch and lower cost capability, allowing the Department of Defense, as well as other users, to make the most of the new commercial market for small, inexpensive launch vehicles," the agency wrote. Rocket Lab's Electron booster is a small launch vehicle designed to launch payloads of up to 496 lbs. (225 kilograms) into low-Earth orbit. The rocket has a Kick Stage upper stage to deliver payloads into a target orbit. In a January statement, Beck said the Huntington Beach, California-based Rocket Lab was excited to launch the R3D2 mission from DARPA . "Rapid acquisition of small satellite launch capabilities is increasingly important to US Government organizations like DARPA," Beck said. "The ability to rapidly space-qualify new technology and deploy space-based assets with confidence on short notice is a service that didn't exist for dedicated small satellites until now."